A protocol for determining the vitreous phase densities of micro- to pico-liter size drops of aqueous mixtures at cryogenic temperatures is described. Shen, C., Julius, E. F., Tyree, T. J., Dan, R., Moreau, D. W., Thorne, R. Measuring the Densities of Aqueous Glasses at Cryogenic Temperatures. J. Vis. Exp. (124), e55761, doi:10.3791/55761 (2017). We demonstrate a method for determining the vitreous phase cryogenic temperature densities of aqueous mixtures, and other samples that require rapid cooling, to prepare the desired cryogenic temperature phase. Microliter to picoliter size drops are cooled by projection into a liquid nitrogen-argon (N2-Ar) mixture. The cryogenic temperature phase of the drop is evaluated using a visual assay that correlates with X-ray diffraction measurements. The density of the liquid N2-Ar mixture is adjusted by adding N2 or Ar until the drop becomes neutrally buoyant. The density of this mixture and thus of the drop is determined using a test mass and Archimedes principle. With appropriate care in drop preparation, management of gas above the liquid cryogen mixture to minimize icing, and regular mixing of the cryogenic mixture to prevent density stratification and phase separation, densities accurate to <0.5% of drops as small as 50 pL can readily be determined. Measurements on aqueous cryoprotectant mixtures provide insight into cryoprotectant action, and provide quantitative data to facilitate thermal contraction matching in biological cryopreservation. The physical properties of water and aqueous mixtures in their various phases are of fundamental interest, and are important to in vivo and in vitro understanding of biological systems. In contemporary cryobiology and biological cryopreservation, the vitreous or amorphous phases of aqueous cryoprotectant mixtures are of particular interest1,2. Nucleation and growth of ice crystals can disrupt cells and tissues, and promote protein denaturation and aggregation, so cryopreservation protocols that vitrify the solvent have become increasingly popular. In biomolecular crystallography, the crystallization of solvent in the channels between biomolecules disrupts crystal lattices and degrades diffraction properties. Vitrification is achieved through a combination of rapid cooling, dehydration, and addition of cryoprotective solutes such as glycerol, ethylene glycol, polyethylene glycols (PEGs), alcohols, and salts. Vitrification limits ice crystallization and growth, but does not eliminate all cooling-related sample damage. For example, crystal mosaicity (a measure of the distribution of crystal plane orientations) routinely increases by a factor of 10 to 100 when protein crystals are cooled into a vitrified state3, and post-thaw survival rates of vitrified sperm cells and oocytes vary widely. One damage mechanism is differential contraction of solvent and surrounding material during cooling3,4,5. The equilibrium solvent and solute concentrations within a crystal, cell or tissue are temperature dependent, and the solvent plus the solute and surrounding material may contract by different amounts. Rapid cooling may prevent solvent and solute redistribution prior to vitrification, and differential contraction may lead to large, inhomogeneous, nonequilibrium stresses that cause sample damage. Rational approaches to reducing cooling-induced damage could thus benefit from the knowledge of temperature-dependent densities of liquid and vitrified aqueous mixtures. At solute concentrations above 50% weight of solute to weight of solution (w/w), most aqueous cryoprotectant mixtures can be vitrified with modest cooling rates of 10 K/s or less, allowing production of and density measurements using large vitreous samples6. Density can then be determined using Archimedes' principle, by measuring the apparent weight of the sample when suspended in a liquid cryogen like nitrogen. 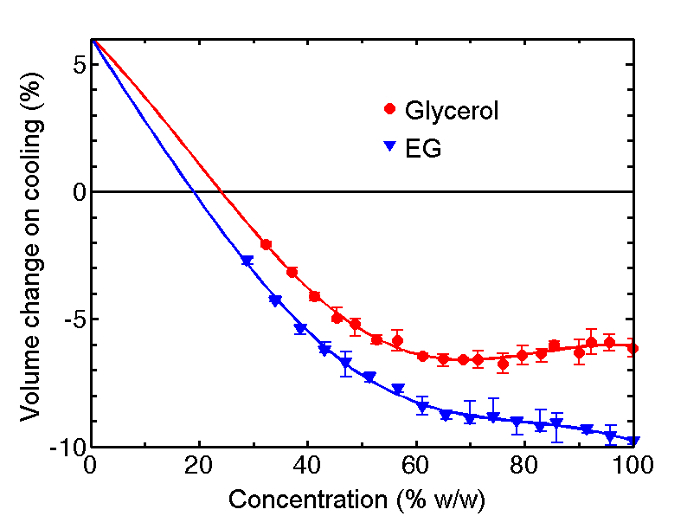 However, as solute concentration decreases, cooling rates required for vitrification increase rapidly: Cooling rates for aqueous glycerol mixtures increase from <10 K/s at 50% weight of solute in g to volume of solution in mL (w/v) to >1,000 K/s at 25% w/v7. Heat transfer becomes boundary-layer limited, so that achieving larger cooling rates requires smaller and smaller samples8. Measurements of the density of pure vitreous water and ice have been achieved by depositing micrometer-diameter (femtoliter volume) drops in a vacuum onto a cryogenically-cooled surface so as to build up a macroscopic (gram mass) sample. The density of this sample was determined by cryoflotation in a liquid nitrogen-argon mixture, in which the density of the cryogenic liquid was adjusted until the sample became neutrally buoyant9. However, generating large samples from a large number of small drops in a way that minimizes void volumes – an important source of error in previous vitreous phase density measurements – is non-trivial. For aqueous mixtures, differential evaporation of solution components during aerosolization and deposition in a vacuum can lead to substantial uncertainties in deposited concentrations. We have developed a method, based on cryoflotation, that allows accurate density determination of aqueous mixtures using individual drops as small as 50 pL10. These drops can be rapidly cooled while retaining their original concentrations, and their cryogenic temperature state (vitrified or crystalline) can be assessed using a simple visual assay that correlates with X-ray diffraction measurements. This method is broadly applicable to aqueous and non-aqueous mixtures, and can be extended to a variety of biological samples including cells (e.g., stem and egg), tissue samples, and protein crystals having low-temperature densities between 0.8 and 1.4 g/mL. NOTE: Because weights are more easily measured to a high accuracy than volumes, solution concentrations are measured in w/w units. All densities and melting or boiling temperatures assume an atmospheric pressure of ~100 kPa. The following steps describe the preparation of a 35% w/w glycerol solution. The same procedure can be used for other concentrations and solutes. where x is the solute mass fraction (0.35) and ρw= 1 g/mL is the density of water. Place a 15 mL centrifuge tube (or other volume-calibrated water-impermeable container) on the pan of an analytical microbalance. Dispense the desired mass of solute/cryoprotectant (e.g., 3.77 g glycerol for a 35% w/w solution) into the tube, and record the actual solute mass. Vortex the container for 30 s (for liquid solutes) or 5 min (for solid solutes), until the solution is optically homogeneous. Measure and record the final mass of the solution. Seal the container with an airtight cap and store at constant temperature (293-298 K). Place the experimental apparatus described below in an enclosure and flow dry air (>5% relative humidity (r.h.)) into the enclosure. NOTE: The enclosure may be a simple metal frame with its top and three sides sealed with clear plastic sheet and with experiment access via a fourth side covered with flexible plastic sheet. Wear face shields and full body covering to minimize moisture introduced by the experimenter. Moisture condensation and ice formation can interfere with cryogenic temperature density measurements in several ways, and so it must be minimized. Place a disk of neoprene rubber on the bottom of a 4.5 L glass Dewar flask, to protect the Dewar flask from damage. Carefully insert a high thermal conductivity copper chamber (a hollow cylinder with a sealed bottom) into the flask until it rests on the rubber disk. Adjust struts projecting outward from the chamber to the Dewar walls so that the chamber is centered and has no tendency to rock. NOTE: The Dewar flask will hold liquid nitrogen, and the much smaller volume copper chamber will hold a liquid N2-Ar mixture. The liquid nitrogen provides a thermal bath that maintains the copper chamber and its contents at a constant temperature of 77 K and reduces boiling and evaporative losses in the chamber. The chamber's small diameter suppresses surface waves that can interfere with buoyancy measurements, and helps isolate the liquid within the chamber from frost and ice formed elsewhere in the apparatus. Insert the outlet of a gas tube with dry N2 gas flowing at ~2 L/min down to the bottom of the copper chamber, and purge the chamber of moist air. Slowly pour liquid nitrogen into the Dewar flask, outside the copper chamber, allowing time for nitrogen boil-off. NOTE: The final fill level, after boiling has ceased, should be within approximately 4 cm of the top of the copper chamber. Cover the outer portion of the Dewar flask with an annular foam insulating lid. Remove the dry N2 gas purge tube from the copper chamber and insert into a matching opening in the lid. NOTE: The combination of N2 gas from boil-off in the Dewar flask and from the purge flow expels any moist air and prevents it from condensing and crystalizing on cold surfaces. Slowly pour liquid nitrogen into the copper chamber. The final fill level, after boiling has ceased, should be within approximately 4 cm of the top of the copper chamber. Place a thin, optically transparent plastic sheet over the central opening or vent in the lid, and reduce the N2 gas flow rate to ~0.2 L/min, leaving a slight overpressure of N2 gas within the gas spaces above the cryogenic liquids. NOTE: As long as cryogenic liquids are present in the Dewar and chamber, continue adjusting the N2 gas flow as needed to maintain this overpressure and prevent moisture from entering into the Dewar and forming ice. Determine the apparent mass of a ~1 g, ~0.4 mL PTFE test mass (Table of Materials) in air at T= 298 K by placing it on the pan of a calibrated analytical microbalance. Determine the volume V(298 K) of the test mass at T = 298 K using a gas pycnometer, or by dimensional measurements using calipers. If using dimensional measurements, the test mass must have a simple, precise shape (no tapers or rounded corners) and the volume of the through-hole (for the suspending line) should be determined. where ρair = 1.23 g/L (~0.1% correction). Place the microbalance on a stable platform roughly 10 cm above the Dewar flask and verify its calibration. Suspend the test mass using a 2 mil (50 μm) monofilament line strung from the hook on the underside of the microbalance (designed for hanging mass measurements) and through a hole in the test mass. Determine the apparent mass in air, and compare with the measurement in step 3.3, correcting as needed for the mass of the line. Determine the volume V(77 K) of the test mass at T = 77 K by measuring its apparent mass in pure liquid nitrogen, mapp in LN2. Lower the test mass into the liquid nitrogen within the copper chamber until it is fully submerged. When boiling has ceased, measure the apparent mass. NOTE: If the liquid nitrogen in the copper chamber is quiescent and air currents between the microbalance and the liquid surface are minimal, this mass can be measured to greater than ± 0.0002 g accuracy. Estimate the buoyant force on the submerged portion of the line, and verify that it is small compared with measurement errors. Flow Ar gas at a flow rate of ~2 L/min through a coiled tube to its outlet. Place the coiled tube on top of the upper struts that stabilize the position of the copper chamber, just above the liquid nitrogen level and below the top surface of the Dewar. Cold N2 and Ar gas will build up above the cryogenic liquids, and thermal conduction, convection, and radiation will cool the tubing and the Ar gas within. After allowing the coiled tube to cool for 5 min, place the outlet of the tube in the copper chamber, at least 10 cm below the surface of the liquid nitrogen. Then cover the Dewar with the annular lid and transparent sheet. Adjust the Ar flow rate until Ar bubbles rise from the tube outlet to the top surface of the liquid nitrogen. Then reduce the flow rate until the bubbles form at the outlet but dissolve or liquefy just before breaking the liquid nitrogen surface. NOTE: As the Ar concentration in the copper chamber increases, periodically adjust the Ar flow rate as needed to maintain bubble formation. If the Ar flow rate is too low, the Ar may freeze inside the tube and block the flow. Add liquid nitrogen as needed to maintain its level in the surrounding Dewar. Remove ice as it accumulates on cold surfaces. Periodically mix the liquid by inserting a thin (e.g., 35 micron), circular sheet of copper foil attached to a thin insulating rod into the copper chamber, and slowly moving it up and down like a piston. This will reduce concentration gradients and the tendency for Ar to crystallize out of the solution. Calculate the target density for the N2-Ar mixture by estimating the T =77 K density of the sample to be measured, e.g., measurements at higher concentrations of the sample's non-aqueous component. Attach the test mass using the monofilament line to the hook on the underside of the microbalance measuring pan, measure its apparent mass in air, and confirm agreement with the measurement in step 3.1. Mix the N2-Ar solution to eliminate concentration and density gradients as in step 4.5. Precool the test mass to T = 77 K by lowering it into the liquid nitrogen outside the copper chamber. Raise the test mass into the cold layer of nitrogen gas above the liquid nitrogen, wait for residual liquid nitrogen to evaporate off the test mass, and then lower the cold, dry test mass into the N2-Ar mixture until it is fully submerged and within 2 cm of the liquid surface. Increase the solution density by flowing additional Ar until the desired initial density is obtained. Sample drops that sink can easily be lost, so the initial density should be at least a few percent higher than the expected sample density. The sample will then float, making it easier to keep track of it, and the N2-Ar mixture density will then only need to be adjusted downward by adding liquid N2. Remove the Ar precooling coiled tube and allow to warm and dry before next use. Immediately prior to drop dispensing and cooling, repeat step 1.5 to mix the nitrogen/argon cryogenic liquid. Be careful not to introduce any bubbles. Remove the sample tube's airtight cap. Using a clean 1 mL syringe, extract up to 1 mL of solution, and replace the cap. Attach a 27 to 33 G needle onto the syringe, and then push a small amount of sample through the needle to expel air and any residues from previous dispensing. Two methods may be used to project sample drops into the N2-Ar mixture. For samples with large non-aqueous component concentrations (>45% w/w) that can be vitrified with modest cooling rates, lightly press the syringe to displace a small (250 μm to 1 mm) diameter, ~10 nL to 1 μL drop that hangs from the needle tip by surface tension. Gently tap the needle to detach and project the drop toward the liquid N2-Ar mixture. For samples that require faster cooling for vitrification, place the outlet of a gas tube connected to a vacuum generator (supplied by lab compressed air) in the gas space above the liquid N2-Ar mixture, and gently suction away the cold gas layer that forms. This increases cooling rates for small samples11. Carefully touch the needle tip to a 25-75 μm thick clear polymer strip to dispense a small volume (<10 nL, corresponding to a drop diameter <200 μm) of sample. NOTE: To obtain the smallest, most nearly spherical, and most easily removed drops, soak the strip in a hydrophobic coating solution for 10 min and let dry prior to sample dispensing. Grab the strip using an attached plastic or wood rod, and manually plunge the rod plus the strip into the liquid N2-Ar mixture. Once the drop has solidified and boiling has ceased, grab the strip edge opposite the rod using tweezers. Flex the strip, keeping it immersed in the liquid N2-Ar, until the sample drop pops off and floats to the surface. Using a long working distance (5-10 cm) binocular microscope and bright, cool illumination from an LED or fiber optic illuminator, carefully examine the drop while keeping it immersed in the liquid N2-Ar. Vitrified drops should appear clear12,13. Reject drops that are hazy or cloudy (likely containing more than one phase) and/or that show optical imperfections including cracks (which may be associated with voids that change the average density). NOTE: Painting the inside surface of the copper chamber to provide a black background can facilitate the identification of sample imperfections. The dispensed drop will initially float, sink, or (rarely) be neutrally buoyant in the N2-Ar mixture. Floating drops may sometimes be held up by surface tension, tiny bubbles, or adhered ice particles. Inspect the entire drop surface with the microscope. Displace the drop downward from the liquid surface using a small (2-3 mm diameter, 10 cm long) precooled plastic or wood rod and observe its response. If the drop sinks, increase the density of the liquid N2-Ar using the procedure in step 4 until the drop becomes neutrally buoyant or floats. If the drop floats, decrease the density of the liquid N2-Ar by adding liquid nitrogen using a 1.8 mL cryovial. At large initial mixture densities (1.2-1.3 g/mL), adding N2 in 1 mL increments gives appreciable density changes, but this should be increased toward 5 mL at low densities (0.8-0.9 g/mL). Gently mix the N2-Ar (so as not to lose track of the sample drop) using the thin perforated copper foil sheet up-and-down in the copper chamber. After each N2 addition, use a small pre-cooled rod to gently displace the floating drop downward into the liquid, and observe its speed as it returns to the surface. When the solution density has been adjusted so that the drop appears to be neutrally buoyant or ascends very slowly (<50 μm/s will ensure ~0.1% or better density accuracy for drops with volumes down to 50 pL), measure the N2-Ar mixture density as described in step 5. Then add additional liquid N2 until the drop first begins to slowly sink, and measure the N2-Ar mixture density again. These two measurements will provide bounds on the drop density. 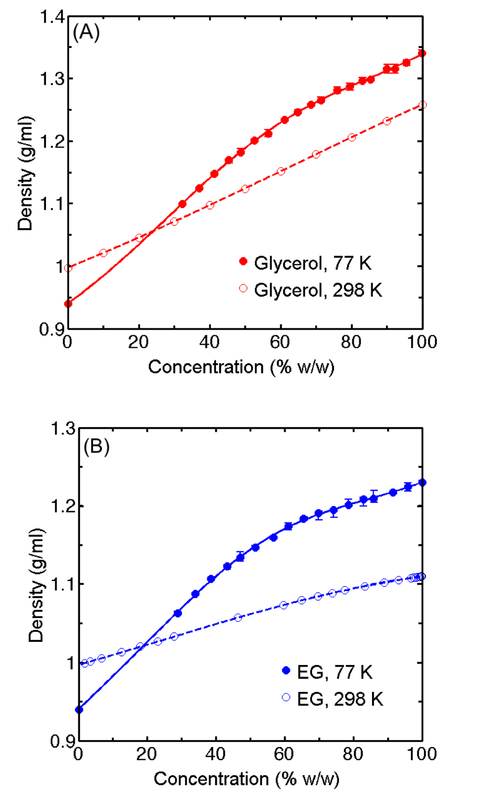 Density measurements at T = 77 K for vitrified drops of aqueous glycerol and ethylene glycol versus cryoprotectant concentration are shown in Figure 1A and Figure 1B respectively, and the corresponding change in specific volume between T = 298 K and 77 K, calculated using previously determined T = 298 K densities, is shown in Figure 2. At high cryoprotectant concentrations, the solutions contract on cooling to the vitrified state, while pure water expands. Near 20-25% w/w solutions of both cryoprotectants are predicted to show no net expansion or contraction. The slope of the volume change versus concentration has the largest magnitude below 40% w/w, where the effects of additional cryoprotectant on water's tetrahedral low-temperature structure are most pronounced. Figure 1: Vitreous Phase T =77 K Density Versus Cryoprotectant Concentration. T =77 K density versus concentration for vitrified aqueous drops containing (A) glycerol and (B) ethylene glycol. Data is presented as mean ± SEM of three individual drops. Please click here to view a larger version of this figure. Figure 2: Change in Specific Volume on Cooling from Liquid at 298 K to the Vitreous Phase at 77 K. Percent volume change on cooling from 298 K to 77 K for aqueous solutions of glycerol and ethylene glycol. The T = 298 K solution densities are obtained from previous measurements14,15. Data is presented as mean ± SEM of three individual drops. Please click here to view a larger version of this figure. The present apparatus and methods, developed primarily by undergraduates with limited access to instrument-building tools and machinery, nevertheless delivers highly accurate density measurements for individual liquid drops as small as 50 pL. In the concentration range near and above 50% w/w, where small cooling rates are sufficient to obtain vitrified samples, the densities agree with those obtained in previous measurements on bulk samples. Extrapolations of the present densities to 0% concentration – pure water – also agree quite well with the accepted density of low-density amorphous ice at 77 K9. Generating the N2-Ar mixtures required between 30 min and 5 h of Ar flow, depending upon the final N2-Ar density needed to render a given drop composition neutrally buoyant. This time may be reduced by using a diffuser or multiple gas tubes to increase the surface area for Ar mixing in the cryogenic liquid. Adjusting the N2-Ar density until a drop is ascertained to be neutrally buoyant can also be time consuming, especially for small radius (r) drops that have small terminal speeds ( r2) and so require more careful observations. The N2-Ar mixture tends to develop a vertical density/composition gradient, and so must be regularly mixed. Consequently, determining a single vitreous phase density point for a given solute type and concentration, requiring measurements on at least 3-5 drops, can take several h.
At each concentration, the densities of two or three drops are typically measured. The "density" of each drop is estimated as the average of the measured upper and lower bounds on the density, given by the largest measured N2-Ar density that made the drop sink and the smallest density that made it float. Since both a tight upper bound and a tight lower bound – where tightness is assessed by the speed of ascent or descent of the drop – are not always obtained in measurements on a given drop (e.g., the drop may be lost during mixing), measurements on drops of the same concentration and size were sometimes combined into a single density estimate. To reduce experiment times, attempts were made to prepare and store high-density N2-Ar mixtures in cryogenic storage containers for use one to three days later. In all cases, Ar crystallized out of the solution and the liquid density decreased with storage time. Ar solidification and liquid density decreases also occurred during drop density measurements if the liquid N2-Ar was not regularly mixed. A major challenge in these measurements is minimizing frosting and ice formation. Water vapor condensation, ice formation, and ice accumulation on the sample cooling chamber, on other cold surfaces, in the cold gas above the N2-Ar mixture, and in the N2-Ar mixture itself can contaminate samples used in density measurements, promote ice nucleation within them, and change their apparent density. Ice on the sample and floating on and in the liquid N2-Ar mixture can make assessing the sample's low temperature state (vitreous or polycrystalline) difficult. To minimize ice formation, regularly inspect all cold surfaces for ice. Carefully remove any ice mechanically or using warm dry N2 gas. If ice accumulates in the copper chamber, remove it using a fine mesh screen, or else remove, empty, dry, and refill the chamber. The minimum (critical) cooling rate required to obtain a vitrified sample increases with decreasing solute concentration, approaching 106 K/s for pure water7. Sample cooling rates depend on drop shape and size (increasing with decreasing diameter), the speed with which the drop is projected into the liquid cryogen, the presence of cold gas above the liquid cryogen (which usually decreases cooling rates), and the properties of the liquid cryogen. Generally, cooling rates larger than 1,000 K/s require drops with volumes (diameters) smaller than ~1 nL (~100 μm). The lowest solute or cryoprotectant concentration for which vitreous densities can be measured is set by maximum drop cooling rates, and by the smallest size drops for which the visual assay for vitrification can be reliably used. Cooling rates could be increased by a factor of ~5 by cooling samples in liquid propane or a liquid propane-ethane mixture. Unlike liquid N2, these cryogenic liquids have a large separation between boiling and melting temperatures and so can absorb much more heat without heat-transfer-limiting surface boiling. Cooled drops could then be transferred to the N2-Ar mixture for density measurements. The transition from clear drops to hazy or cloudy drops is abrupt, occurring over a narrow range of solute concentration (roughly 2% w/w) and cooling rate, and has been correlated with the appearance ice rings in X-ray diffraction patterns16,17. However, accurate visual clarity assessment becomes more difficult as drop volumes decrease toward 10 pL. The accessible range of sample densities using N2-Ar mixtures is set by the densities of the pure liquids, 0.81 g/mL and 1.40 g/mL, respectively. Liquid Ar-Kr mixtures are susceptible to Kr crystallization, but might be used to extend this density range provided the liquids were constantly mixed. The methods described here are broadly applicable to determining densities of aqueous mixtures, cells, cell aggregates, other biological materials, and other systems where small samples and large cooling rates are required to achieve the desired low-temperature phase. These densities will be useful in understanding and minimizing sample damage in cryopreservation, and in understanding the behavior of water in aqueous solutions and in confined and crowded environments. This work was supported by the NSF under award MCB-1330685. DWM acknowledges partial support from Cornell University's Molecular Biophysics Training Grant (NIH T32GM0082567). copper chamber This fabricated part is comprised of a 1.43" diameter, 0.017" wall thickness copper tube with a solid cylindrical copper base soldered to seal one end. The copper base is 0.87" tall and the overall chamber height is 7". foam insulating lid This part is fabricated from 4 lb/ft3 crosslinked polyethylene foam (supplied by Technifab, 1355 Chester Industrial Parkway, Avon, OH), and has an OD of 2.42", and ID of 1.52", and a thickness of 0.79". PTFE test mass This fabricated part is a 0.246" diameter, 0.580" tall cylinder with a 0.060" diameter hole running perpendicular to and intersecting the cylinder axis ~0.10" from one end. perforated copper foil mixer 1.4" diameter, 35 micron thick copper disk, cut from 1 ounce/ft2 copper sheet and perforated with holes using an awl or other sharp pointed tool. Insert 1-2 mm diameter rigid thermally insulating (plastic or wood) rod into the center and fix using epoxy as needed. Fahy, G. M., Wowk, B. Principles of Cryopreservation by Vitrification. Cryopreservation and Freeze-Drying Protocols. 21-82 (2015). Nagy, Z. P., Nel-Themaat, L., Chang, C. -C., Shapiro, D. B., Berna, D. P. Cryopreservation of eggs. Human Fertility: Methods and Protocols. 439-454 (2014). Kriminski, S., Caylor, C. L., Nonato, M. C., Finkelstein, K. D., Thorne, R. E. Flash cooling and annealing of protein crystals. Acta Cryst Sect D. 58, (3), 459-471 (2002). Juers, D. H., Matthews, B. W. Reversible lattice repacking illustrates the temperature dependence of macromolecular interactions. J Mol Biol. 311, (4), 851-862 (2001). Juers, D. H., Matthews, B. W. Cryo-cooling in macromolecular crystallography: advantages, disadvantages and optimization. Q Rev Biophys. 37, (2), 105-119 (2004). Alcorn, T., Juers, D. H. Progress in rational methods of cryoprotection in macromolecular crystallography. Acta Cryst Sect D. 66, (4), 366-373 (2010). Warkentin, M., Sethna, J., Thorne, R. Critical Droplet Theory Explains the Glass Formability of Aqueous Solutions. Phys Rev Lett. 110, (1), 15703 (2013). Kriminski, S., Kazmierczak, M., Thorne, R. E. Heat transfer from protein crystals: implications for flash-cooling and X-ray beam heating. Acta Cryst Sect D. 59, (4), 697-708 (2003). Loerting, T., Bauer, M., Kohl, I., Watschinger, K., Winkel, K., Mayer, E. Cryoflotation: Densities of amorphous and crystalline ices. J Phys Chem B. 115, (48), 14167-14175 (2011). Shen, C., Julius, E. F., Tyree, T. J., Moreau, D. W., Thorne, R. E. Thermal contraction of aqueous glycerol and ethylene glycol solutions for optimized protein-crystal cryoprotection Thermal contraction of aqueous glycerol and ethylene glycol solutions for optimized protein-crystal cryoprotection. Acta Cryst Sect D. 72, (6), 742-752 (2016). Warkentin, M., Berejnov, V., Husseini, N. S., Thorne, R. E. Hyperquenching for protein cryocrystallography. J Appl Cryst. 39, (6), 805-811 (2006). McFerrin, M. B., Snell, E. H. The development and application of a method to quantify the quality of cryoprotectant solutions using standard area-detector X-ray images. J Appl Cryst. 35, (5), 538-545 (2002). Chinte, U., Shah, B., DeWitt, K., Kirschbaum, K., Pinkerton, A. A., Schall, C. Sample size: An important parameter in flash-cooling macromolecular crystallization solutions. J. Appl. Cryst. 38, (3), 412-419 (2005). Bosart, L. W., Snoddy, A. O. Specific gravity of glycerol. Ind Eng Chem. 20, (12), 1377-1379 (1928). Rodrigues, M., Francesconi, A. Z. Experimental study of the excess molar volumes of binary and ternary mixtures containing water + (1,2-ethanediol, or 1,2-propanediol, or 1,3-propanediol, or 1,2-butanediol) + (1-n-butyl-3-methylimidazolium bromide) at 298.15 K and atmospheric pressure. J Solution Chem. 40, (11), 1863-1873 (2011). Berejnov, V., Husseini, N. S., Alsaied, O. A., Thorne, R. E. Effects of cryoprotectant concentration and cooling rate on vitrification of aqueous solutions. J Appl Cryst. 39, (2), 244-251 (2006). Meisburger, S. P., Warkentin, M., et al. Breaking the Radiation Damage Limit with Cryo-SAXS. Biophys J. 104, (1), 227-236 (2013).